It was hissing down with rain all day. Some bank holiday that was. There’s about a day’s worth of digging over and sifting left on the navy bed and I could get the rest of the saffron and winter brassicas tucked up in it. Bit frustrating, but then I am late with most things on the plot, so why not this? And I did manage to do quite a bit over the weekend – digging, first lot of pruning of Mum’s fruit bushes to get them ready for their move to my plot after 30+ years in her garden, harvesting spuds, achocha, padron peppers, cucumbers, tomatoes, courgettes. The 3 Desiree spuds inna bag produced 3.5kg of clean potatoes. This was in 50/50 MPC and stable manure, with £land potato fertiliser and supagrow mixed in, and a second top dressing of fertiliser about 8 weeks after they were earthed up. And a third to half a watering can nearly every day. The remaining Aeron Purple Star runners look like they have pulled through insect invasions & viruses and are now at the tops of the canes. But there aren’t many beans and none of them are going even slightly purple so far, even the bigger ones. 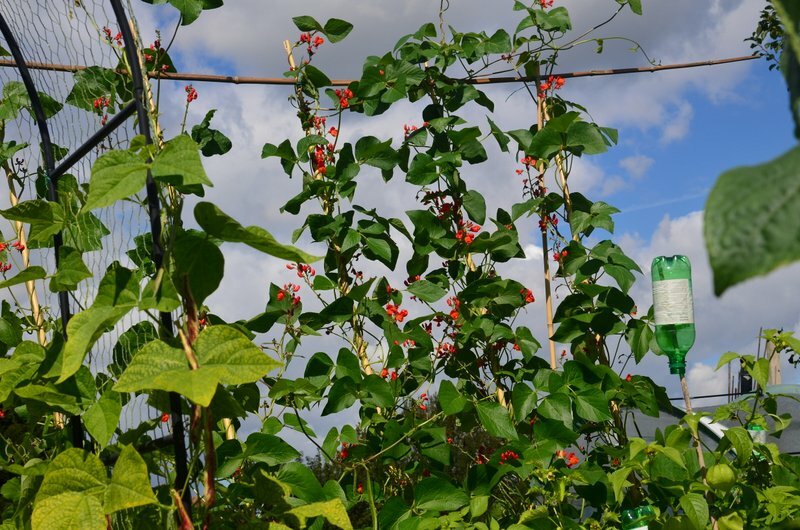 In comparison the Trail of Tears beans are romping away and the arch is a bit wobbly from the weight of the 6 plants. For next year I need to keep more on top of the tomatoes and their sideshoots – mine are very unruly and I guess that’s why there aren’t that many fruit on them. Thankfully dotting them around the plot has worked in escaping blight – only one Maskotka binned. I still can’t find the glass greenhouse info from when we dismantled it back in Jan/Feb this year, so putting it together is so far pretty daunting. I gave in to the B&Q clearance offers this weekend and picked up a polycarbonate palram-style 6×8 for £35. It might be better for me as a complete greenhouse newbie on the plot, if I can anchor it down properly. And I would to worry less about broken glass. No doubt I will be dithering between the two for a bit, but I think I can sell on whichever one I don’t use. On the foraging front I have missed most of the elderberries this year. I went out on the bike in the drizzle this morning and managed to get a scant few for a couple of jars of jam*, but most of the bushes along the river had been stripped bare. The ones at the flat are stripped by wood pigeons – they sit in the bush every morning till the ripe berries are all gone. Need to keep an eye out from May for the flowers and from early August for the berries – and maybe look for a bigger cache somewhere. Sloes seem nearly ready though, so next weekend is picking weekend. Am aiming for 7 bottles of gin this year, so need nearly 5kg of berries. The hedgerows are loaded, so that won’t make much of a dent. *don’t bulk out elderberries with apple next year, it doesn’t work.